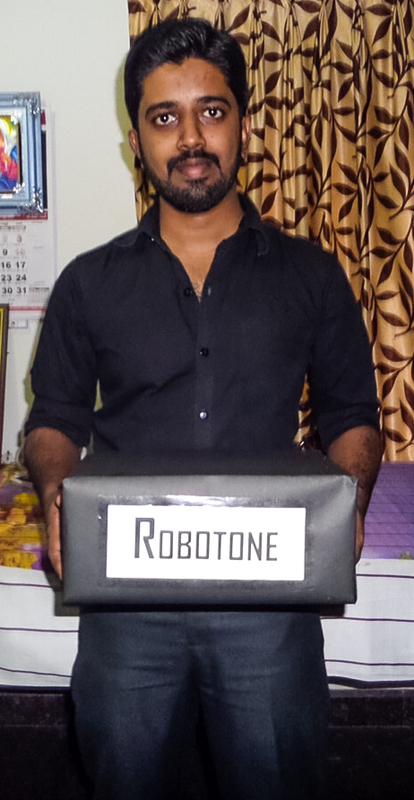 Kochi, May 15: A young engineering student has come up with a gizmo that can facilitate the operation of domestic appliances from places far away from home, courtesy the ‘robotone’. Peter K Joseph, who is a first-year MTech (power electronics) student at Toc H Institute of Science and Technology (TIST) here, has used a “simpler version” of TTC Logic technology (used to operate satellites in foreign nations) for the functioning of robotone, thus making the gadget stand apart from the routine mobile key operational robots that are easily available for sale today. “One can operate the appliances, even if one is abroad. For instance, farmers can control the water supply in their yards when they are away from the farm,” said the 22-year-old inventor, who is a native in Ernakulam district. According to Peter, who is all set to roll out the product into the market, the instrument is equipped with a voice playback system that can detect any language in the world so as to communicate with the user. According to sources, the youngster will also be soon launching an Android application for Robotone. TIST authorities opined that robotone could be a revolutionary product in the fields of electronics and agriculture. It can also help control electricity consumption. Peter’s earlier projects during his graduation were acclaimed even at the national level. Robotone has already won laurels. It was chosen this year as the best project of Indian by International Electric Engineering Agency. Also, the International Centre for Technological Innovations, an Alappuzha-based agency to support young scientists, selected it among the projects chosen from India. Peter’s classmates Varun Krishnan, Vaishak V, Mary Jaqueline Joseph, Merin Jacob and Keerthi Suresh are also accompanying him in the project. Providing aid to the project are TIST Head of Department of Electronic assistant professor Preetha Thekkath, Power Electronics coordinator assistant professor Mangaladevi K T and Principal Dr D Wilson H Vincent.